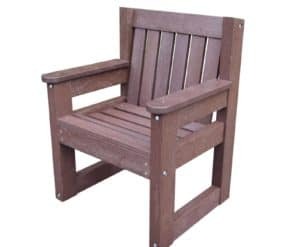 Derwent recycled plastic carver garden chair available in two width options and two colourways. Complete the set with our Dale benches and one of our garden tables. Our Derwent Chair made from recycled plastic that will last a lifetime. Attractive carver style chair that would complete our Denby Dale Garden Set, or look great with the Valley occasional table in any outdoor space. A new addition to our ever increasing range this versatile and comfortable chair will be an absolute winner. Outdoor seating has never been so easy. Manufactured from recycled plastic waste, that would have been destined of UK land fill, also means the Derwent is a good environmental choice. Equally at home in a private garden, or public park, the Derwent will provide a focal point and a welcome destination for a well earned feet up moment. Just recived my delivery of Derwent chairs and valley table can’t express how happy I am with the quality and service and am sure I will enjoy for many years to come. We would just like to thank you, and to everyone involved from ordering, making and delivering our garden furniture. We are highly delighted with your products, and very impressed with all your staff’s professionalism.